Last week’s article was intended to get you thinking about your ideal health and body shape goals, and to translate those thoughts into a S.M.A.R.T. goal. If you are one of the many people who trains regularly but has not seen any significant change in body shape as a result, this week’s article will be of interest to you. Numerous research studies have confirmed that You Cannot Out-Train A Bad Diet. It may surprise you to hear (coming from a Personal Trainer), that exercise, without proper nutrition and lifestyle support, is almost useless when it comes to long-term weight loss. Of course, many people drop body fat when they go from doing no exercise to walking or jogging a few times a week. But unless they also address their diet and lifestyle, these gains are minimal and very short term. There are numerous reasons why this happens. The main one is that they rarely have a good nutritional strategy to support this extra activity. So then, what exactly is Good Nutrition? As a Precision Nutrition Certified Level 1 Coach, these are the guidelines that I give to my clients. Good Nutrition is said to meet the following four criteria. 1. Controls Energy Balance: The phrase “Energy Balance” represents the relationship between “energy in” (calories consumed in food and drink) and “energy out” (calories used in daily living and exercise). Negative Energy Balance (Energy Out Greater than Energy In) will tend to lead to weight loss. On the other hand Positive Energy Balance (Energy In Greater than Energy Out) will tend to lead to weight gain and if it continues uncontrolled can also lead to obesity-related diseases like Type 2 diabetes and heart disease. The problem is that increasing your activity/training level is only one side of the equation: calorie reduction in the form of eating less food is the critical part. 2. Provides Nutrient Density: Nutrient dense food provides a lot of vitamins, minerals, fibre, healthy fats in a typical serving. On the other hand, calorie density refers to the situation in which there are a large amount of calories in each serving. To put it simply we need to increase our consumption of nutrient dense foods like vegetables, lean meats, fish, eggs and fruit, while reducing processed, sugar-filled junk. 3. Helps Achieve Health, Body Composition & Performance Goals: It’s actually very easy to lose weight. Some nutrition plans or “diets” may achieve weight loss but can negatively affect health and sport/training performance and recovery. A diet that’s based on sound nutritional principles will allow you to lose body fat, while helping you to improve your overall health, physical and mental energy levels and sports/training performance. 4. Honest and Outcome Based: Our nutrition plan needs to be accurately recorded and also needs to achieve the desired goals/outcomes. Research studies have shown that, in general, people tend to overestimate the amount of healthy food they eat while underestimating the amount of junk food they consume. 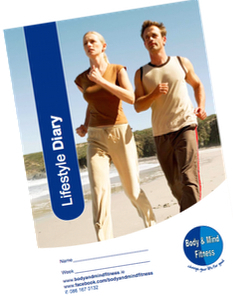 My Personal Training and Bootcamp clients are given a weekly food/lifestyle diary to complete. That’s not to say that they all do it! But without doubt, the clients that get the best body composition improvements are the ones that fill in the diaries and make the recommended changes on a consistent basis. Those that merely train without handing in their diary tend to stay in weight-maintenance mode. Today we’ve taken an overview of a healthy diet. It’s not rocket science and I’m sure you’ve heard it before, but it’s extremely important to achieve those medium and long-term goals. And, in my opinion, one of the most important aids to eating well is keeping a food diary. So what I’d like you to do this week is to record everything you eat and drink – you may be surprised at how often you eat un-healthy foods and how little nutrient-dense food you consume. In order to make it a little easier for you, please feel free to email me and we’ll send you an electronic version of our Food/Lifestyle diary. Next week we’ll be more specific on what to eat and what to avoid.